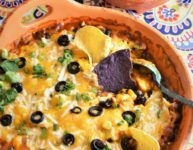 Baked Enchilada Bean Dip | Recipe For A Party | Life is a Party, So Celebrate! Mexican food is a very popular cuisine and I think most of us love it, right? Don’t we all line up at the restaurant door on taco Tuesdays? 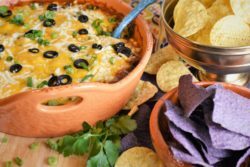 This Mexican inspired vegetarian party dip will fill your cravings for enchiladas that you’ve been having, just dip your tortilla chips in this savory warm gooey dip and sip your margarita and you will be in your happy place. This easy recipe is pulled together in minutes and you can make it a day ahead and the next day just put it in the oven for 30 minutes and it’s ready for your party crowd. 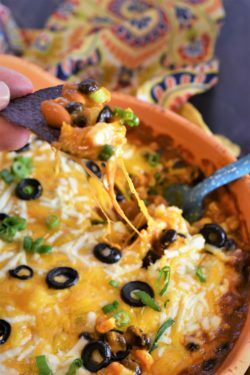 This dip is easily enough for 10 to 12 hungry guests, it will fill a deep dish pie plate. 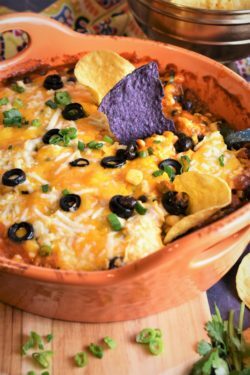 Note: you can prepare this dish for your vegan guests as well, just substitute the cheese for your favorite vegan cheeses, there are so many available on the market now. 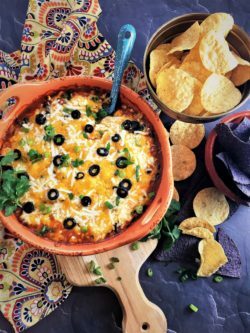 This dip tastes like authentic Mexican enchiladas, dip tortilla chips in this and start sipping your margarita! In a medium mixing bowl, combine the enchilada sauce, chili powder, cumin, corn starch and whisk well. I just finished enjoying this tasty recipe with my family. We paired it with an avocado cabbage salad and it made for the perfect Sunday lunch. I’m a busy mom, so I LOVE that this can be made ahead and warmed when ready! I will be making this again and again!